What has suddenly become one of my most anticipated games of the year, Mario Tennis Aces, now has a new trailer courtesy of last Thursday's Nintendo Direct. Scope out this extended trailer showcasing the new gameplay elements like Zone Shots and Super Shots, to see why Mario Tennis Aces has launched high on my list of most wanted games in 2018! I never like having to review a game negatively. For some people it's a lot of fun, but I personally don't find joy in shredding apart the work of someone else. 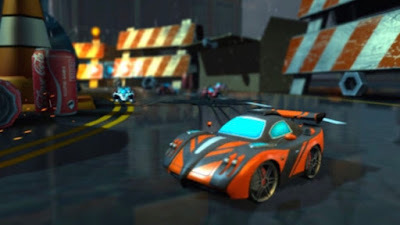 I try to be selective with what games I cover, and Eclipse Games' Super Toy Cars seemed like a fun, simple racing game. I was unfortunately mistaken, as you'll see by my review. I have vivid and joyful memories of hanging out in my childhood home, building and constructing massive kits built out of Micro Machines and Hot Wheels toys. (But never combined, as the Micro Machines are too small to be mixed with the Hot Wheels. Look it up -- it's a punishable offense!) So, you can bet that my interest was piqued when I came across Eclipse Games' Super Toy Cars, a game that recently released on the Nintendo Switch. Unfortunately, I won't quite have vivid and joyful memories of playing this game. Far from it. Super Toy Cars doesn't have the most original name out there, nor does it have the most original racing modes to it either. The main single player mode pits you against challenge after challenge, trying to earn the maximum amount of points in each event if you so desire. Of course, there's no real motivation to do so, so I simply went through the motions and placed in a race so I could move on to the next event. These challenges/events don't boast the highest level of creativity, but they're certainly serviceable. There are multi-lap races with weapons, time trials, elimination-style contests, checkpoint-to-checkpoint trials, and the lone imaginative type of race on display, one where the rules are similar to elimination but instead of having a clear track to race on, it's one littered with explosive mines. Even still, this mode can underwhelm when the hills and ramps of the tracks hide mines from your vision until it's too late. To be fair, that doesn't happen often, but it's just another issue I have with Super Toy Cars in general that amounts to a mountain of problems rather than a molehill. As you complete events, you earn money that can be used to purchase and upgrade vehicles. 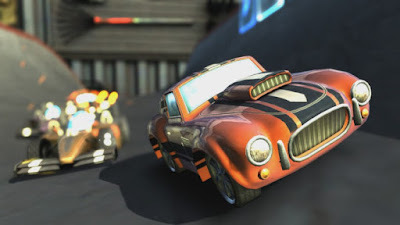 Completing events in first place awards you with new skins for vehicles, which is something fun if you can stand the obnoxious physics and controls to do this. (I couldn't.) There are a wide variety of vehicles to purchase and collect, offering something for everyone, but at the same time, as you progress in the game, you have to keep selecting better vehicles. You can't just stick with your favorite model and just upgrade it continuously. There's a limit to how many times you can upgrade a given vehicle, and the AI just gets faster and faster. You'll simply get left in the dust in races and won't be able to compete without buying new vehicles, even if you don't care for their models or builds. Then comes the truly despicable part of Super Toy Cars: the actual racing itself. Nothing is more exciting than speeding off a ramp and hitting the ground, suddenly losing every last bit of momentum you had in the process. Actually, I'm lying. Nothing is more exciting than speeding off a ramp and hitting the ground, having a random chance of suddenly losing every last bit of momentum you had in the process. There's also the thrill of having opponents push your car -- no matter what its weight is -- and being spun out of control, losing valuable time and race positions in the process. Or how about the astonishing awesomeness of going at full speed, drifting, and having that drift that is supposed to maintain your speed around corners instead slow you down much more. Not really worth drifting just to gain power for a boost, now is it? Nearly every facet of Super Toy Cars just comes off as irredeemable. 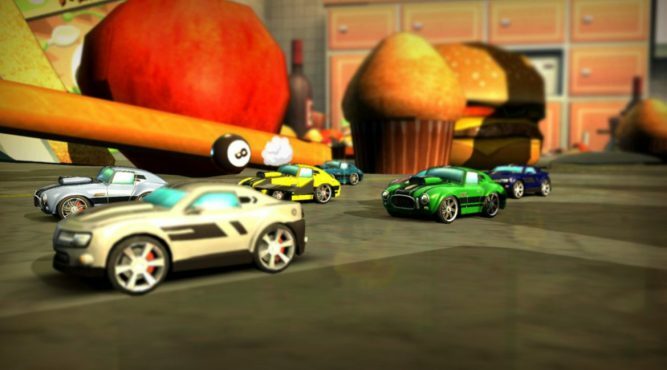 From races where cars push you around, into walls on a frequent basis, while you can't do the same to them -- no matter your own vehicle's weight, to visuals that do less than impress, Super Toy Cars is a frustrating mess to play. The handling of each vehicle doesn't help either, offering at best a slippery feel to all of the cars racing, making any type of precision performance driving an impossibility. Simply put, I'll just stick with my Micro Machines and Hot Wheels rather than this crash and burn of a racing game. Review copy provided by Eclipse Games.